Today is Isru Chag Sukkos [Simchas Torah in Chutz La'Aretz, the Diaspora], and the 27th yahrzeit of Rebbe Ben Zion Chaim Shlomo Meshulam Zusia Twerski, ztvk"l, Admor of Hornosteipel and Rav of Denver, one of the foremost Rebbes, in my opinion, of the 20th Century. The Rebbe's words reverberate in our hearts, and continue to inspire us till this very day. Rebbe Shloime had a great appreciation for music, as is evidenced not only by his own niggunim [as mentioned in previous posts], but by the following account. This was excerpted from the recent Sukkos issue of Mishpacha Magazine, in an article by Yisroel Besser called "Chords That Draw Close," which features an interview/conversation with Rebbe Shloime's son and successor, Rebbe Mordechai Dov Ber [Reb Mottel] Twerski of Hornosteipel-Flatbush. The article also discusses an upcoming recording by R. Srully Williger of Rebbe Mottel's niggunim, called "The Rebbe’s Niggun," (which hopefully I will review here after I obtain it). 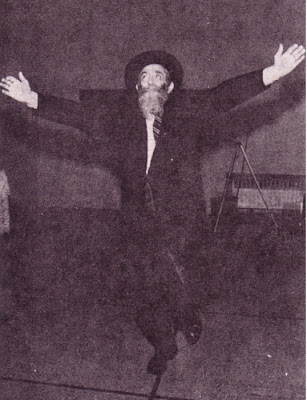 Rebbe [Mottel] Twerski's father, Rebbe Ben-Zion Chaim Shlomo Meshulam Zusia, known as Rebbe Shloime of Hornosteipel-Denver, was an ethereal mystical figure. "He lived with music, [and] would become one with a song. And his music, like everything else about him, was a bridge back to the Baal Shem Tov, to worlds that were. My father raised us with such a strong awareness of where we came from that we felt connected to them." Rav Mottel smiles. "I remember how, when I was young, I once related a story that I heard from my father about the great Trisker Maggid. At the time, I referred to him as der Trisker fetter, just the way my father did, as if he were an uncle that I was familiar with; that was the atmosphere in the home, and the songs reflected that as well." "Our home was always filled with music," recalls Rav Mottel. "My mother is descended from the Nadvorna Rebbes and music was central to their avoda as well. My father, the Rebbe, loved music. He would listen to sophisticated complicated symphonies and study them with the depth that he brought to everything. We had a record changer in those days, so that he could hear the lengthy symphonies in their totality. "My father would study songs the way he would learn a sugya [Talmudic section], pondering and analyzing the fine points. I would hear him on the phone, arguing with my uncle, Reb Michel, about which chord could better express the sentiment of a pasuk [Biblical verse]." I ask Rebbe Mottel about the songs on this upcoming release, if there are stories behind the songs. For a fleeting moment, a look of wistfulness crosses his face. "My father was ill, and suddenly, I had to decide 'what to be when I grew up,' so to speak. It was a time of difficult decisions and also of personal development. One night during that tumultuous period, as I was putting one of my young children to sleep, I took [my] guitar in hand and expressed the emotions raging within me." Reb Mottel played the haunting melody for his father Rebbe Shloime, who heard a message of contrition deep within it. "Everyone has their own path to teshuva,'' he remarked. That year, Reb Shloime used the melody as his nusach [recital] for the most poignant tefilla [prayer] of the Yamim Noraim [High Holidays], Unesaneh Tokef. Reb Srully [Williger] sings the tune with those words, K'vakaras Ro'eh Edro. It's the song that Rav Mottel uses in his own shul for the tefilla, and the entire tzibbur [congregation] sings the refrain along with him. I ask if a song that is composed with an appreciation for the words of the pasuk can have a different effect on the listener. "My father would study the words of a pasuk for a long time to ensure that they fit the tune. One has to approach the words with reverence, humility . . . he is coming to say a new pshat [meaning] in the pasuk! "Making up songs is not a simple thing, not if they are meant to do more than merely entertain. I sometimes feel that I don't make up songs; songs are composed through me. Great Rebbes have taught us that the Heichal HaNegina adjoins the Heichal HaTeshuva." I ask Rav Mottel if there is anyone from the recent generations whose music inspired his own. He smiles. I ask it again, and finally Reb Srully interjects, "Do you want to hear the Rebbe say, 'Reb Shlomo Carlebach'?'' I nod. That is indeed what I was hoping for. I turn to Rav Mottel for some perspective on this very enigmatic figure, someone whose songs have clearly influenced not just him, but almost every single serious composer of inspiring niggunim. Okay, let's talk about Reb Shlomo. His songs changed everything. He himself was a remarkable person, and he went way back with my father. When he came to [Yeshiva] Torah Vodaath, just arrived from Germany, he spoke no English, so Reb Shraga Feivel paired him up with my father, who spoke a fluent Yiddish, and they learned together. They forged a close bond, and in later years, when Reb Shlomo was in the gutters of San Francisco pulling Yiddishe neshamos [Jewish souls] out of the filth, he would take broken souls and deposit them on our doorstep. "I remember so many lost, confused people over the years that were traveling back cross-country. They would ring our bell and say 'Shlomo Carlebach sent me to find Rabbi Twerski.' Many of the people that he discovered are today chashuveh erliche Yidden [esteemed, refined Jews] with beautiful families. "What can I say? His life was a big paradox, and that itself made his music so meaningful. There is a definite strain of melancholy that runs through many of them, for he was always struggling, suspended between darkness and light. But aren't we all like that? Can't we relate to the sincere desire to change that is hidden in his songs? Zechuso yagein Aleinu v’al Kol Yisrael – May Rebbe Shloime’s merits protect us all! Wonderful post I really enjoyed it. great post. it was a super article and i loved the whole magazine. besser is the hottest charedi writer these days.